Hope everyone is going well with their Chinese adventure learning! For this discussion, I would like to share my knowledge in some popular holidays. As of now, it is less than a week away from 2018! The very first date is 2018年1月1日, which is January 1, 2018. After that will be Chinese New Year (春節/春节), which is on February 16, 2018 (2018年2月16日). This Chinese date is also equivalent to 2018年2月16號 or 2018年2月16号. For those who are used to the number 八 (guess which hanzi sounds like this one...), there is also a Chinese holiday, which is 爸爸節/爸爸节, Father's Day! Not only is there a usual Father's Day on June 17, 2018, there is also another one on August 8, 2018. If you translate this date in Chinese, we have 2018年8月8日, where all these three numbers contain 8 as their ones digit! This is special since 8 is the lucky number! During 中秋節, people enjoy eating mooncakes (月餅/月饼). Lanterns (燈謎/灯谜; it literally means "lantern riddles") also take place during this special holiday! 新的一年見！ See you in the new year! About a month ago, I completed the Chinese tree. 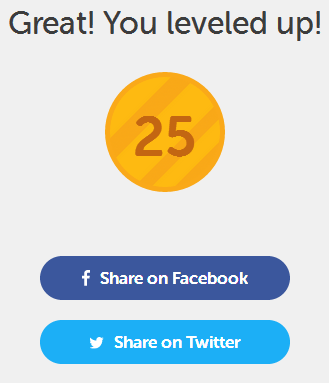 On December 27, 2017, I made to Level 25! This is really before the year 2018! Of course, completing and learning everything from this tree is not enough. My learning adventure does not end here. I am going to continue working out with three Far East languages - Chinese, Japanese and Korean - at the same time, studying and comparing the uses of 漢字. 恭喜你完成多邻国的中文课程! What does it take to reach level 25? For English speakers Japanese is even more difficult than Chinese. You are really courageous and I wish you success! For those who are born in any year of the dog (狗), I would be happy to hear that! Please share!